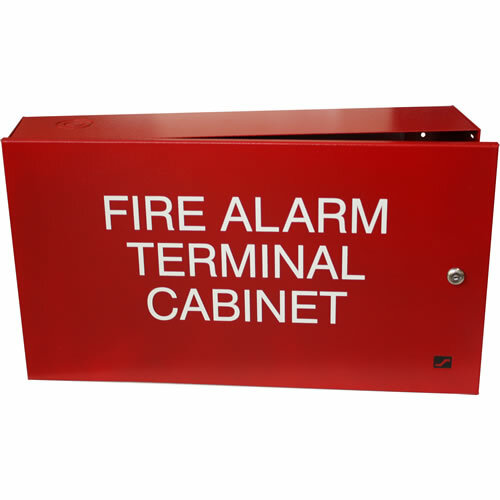 White indelible 2" screened lettering "FIRE ALARM TERMINAL CABINET"
The TCX A "FIRE ALARM TERMINAL CABINET" offers easy identification of fire alarm wiring junctions for troubleshooting and maintenance of system wiring. Highly visible 2" high lettering and a removable "lift-a-way" hinged door contribute to fast location and easy access. This surface mount cabinet is fabricated from 16 gauge steel with a durable, baked on, red textured powder coat finish. The TCX A measures 23½" W x 13" H x 5½"D.
The TCX A includes a high security CAT30 keyed door lock and is UL listed for life safety. 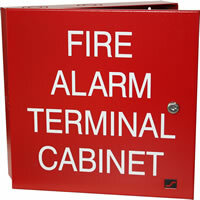 The Space Age Electronics SSU00651 TCX A Terminal Cabinet is a 23.5 x 13 x 5.5-inch steel fire alarm terminal cabinet with 2-inch white indelible lettering and four 16-point high barrier terminal strips included.